7 by 11 inch print. 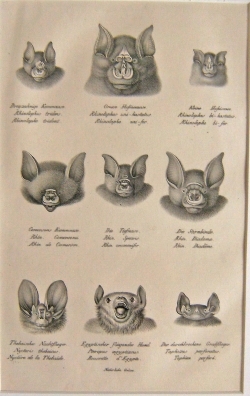 "Rhinolophus tridens., Rhinolopus uni-hastatus, Rhinolophus bi-hastatus, Rhin. Comensornu, Rhin. Speoris, Rhin. Diadema, Nycteris thebaicus, Pteropus aegyptiacus, Taphozus perforatus."